The Predictable iPad Pro bundle gives you access to the device with the largest screen, with Therapy Box app Predictable installed and ready to use. This iPad bundle with Predictable also allows access to Head Tracking, a new Predictable feature! 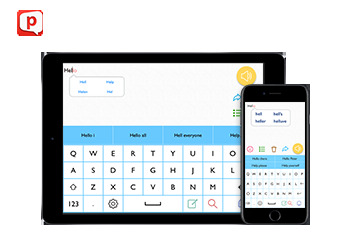 The iPad Pro is the iDevice of choice for people who need a larger screen because of visual impairment, motor skill impairment affecting accuracy, and for those wanting to use the iPad as a recreational device as well as a communication aid.